It was back in the late 1940’s that the legendary Charles began recording and first made the Hot 100 in 1957. “Can’t” was the third #1 song for the performer and his last on the pop chart. His last top 40 single as a solo artist came in 1971, though he last made the Hot 100 in 1990. His posthumous 2004 duets album, Genius Loves Company, hit #1 on the album chart and won Album Of The Year at the GRAMMY Awards. When you’re hot, you’re hot, and this classic trio definitely was in the year 1965. “Name” was the fourth #1 single in a row for the group, following “Where Did Our Love Go?”, “Baby Love” and “Come See About Me”. It would spend two weeks on top of the Hot 100. They ended with twelve shortly before Diana Ross left the group, although they managed to keep cranking out music with a revolving lineup through 1976. Though they quickly attained success in Europe, pop group The Hollies waited several years before their first top ten hit in the U.S. came in September 1966. Stopping seemed to be their thing because in December of the same year, their followup called “Stop Stop Stop” went to #7. During a 1983 reunion, their cover of “Stop! In The Name Of Love” went to #30. They haven’t stopped yet as they remain together. Former President Bill Clinton may have drilled it into our heads from using this in his presidential campaigns, but back in 1977, Fleetwood Mac made “Don’t” a hit in its own right from the landmark release Rumours. 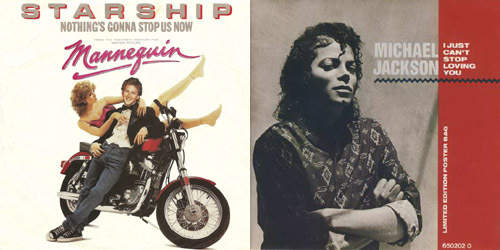 Going to #3, it was the third consecutive top ten single from the album, followed by the #9 “You Make Loving Fun”, which established a then-record for the most top ten songs from one studio album. After first hitting the top 40 in 1974 with “People Gotta Move”, Montreal-born Vannelli achieved much greater success with this ballad from his album Brother To Brother. It rose to #4 late into 1978, becoming his first of two top ten singles (the second coming in 1981) and biggest hit to date. He had a handful of minor singles reach the Hot 100 through 1987 and continued charting in his native Canada into the 1990’s. The first of two Jackson songs on the list was a hot disco record from his first release with Epic following his departure from Motown. From his album Off The Wall, “Enough” quickly climbed into the #1 spot, becoming his first solo song to reach the top of the Hot 100 since “Ben” in 1972. The album would provide him with three other top ten hits through 1980 before regrouping with The Jacksons later that year. In-between albums by Fleetwood Mac, Nicks pursued a solo career with 1981’s Bella Donna, which eventually went to the top spot on the album chart. The first single from it was this collaboration with Tom Petty & The Heartbreakers, which remains her biggest solo song to make the Hot 100 to date. She and Petty would also collaborate on a 1986 live remake of the song “Needles And Pins”, which peaked at #37. Mannequin was big at the box office in the spring of 1987 and so was the theme song from it. “Now” became the final of three #1 singles for Starship, which at the time established a record for member Grace Slick as the oldest woman to have a #1 single at age 47. (That has since been passed by Cher, when she hit #1 with 1999’s “Believe” at age 53.) The group last made the top 40 in 1989 and the Hot 100 in 1991. After the massive success of his 1982 album Thriller, how could Michael Jackson follow it up? Well, five years later came Bad, and this was the first single from it. The romantic ballad shot straight into the Hot 100’s top 40 with a debut at #37 during the week of August 8, 1987, climbing to #1 six weeks later for one week. It was the first of five #1 singles from the album, which was certified 9x Platinum this past spring. The summer of 1991 was all Bryan Adams as the Canadian singer dominated with his chart-topper, “(Everything I Do) I Do It For You”. Following that monster single was this notable change in direction into a rock sound, which hit the top ten in at least a dozen countries, including the United States. Parent album Waking Up The Neighbours was also a big seller, going 4x Platinum. Adams continues to record today. Back in 2008, this Barbadian beauty was just beginning her journey as a Good Girl Gone Bad. Interpolating “Soul Makossa” by Manu Dibango (also prominently featured in “Wanna Be Startin’ Somethin'” by Michael Jackson), the song became another big hit for the singer, going to #3 on the Hot 100 and #1 on the Hot Dance/Club Play chart. Her current release is “Right Now”, featuring producer David Guetta. For more on the stop and go of the pop music flow, follow the blog below and find me on Twitter: @AdamFSoybel. Fleetwood Mac announced several days ago that they’ll be going on tour in 2013, starting up a 34-city tour on April 4 in Columbus, OH. The group, now a quartet of Lindsey Buckingham, Mick Fleetwood, John McVie and Stevie Nicks, may also be putting out an EP in the new year. It would be the first studio release for the band since 2003’s Say You Will, which was certified Gold. Buckingham and Nicks have both released solo albums since then. Even though the lineup and the sound has changed throughout the year, the group’s remained just as popular, a staple of Classic Rock radio over thirty-five years after they first made the top 40. Here’s a playlist of some of my favorite releases from the band and their solo efforts throughout the years. Even from just the opening line, “Loving you / Is it the right thing to do?”, you can tell this one is going to be about a rocky relationship. I mean, “Packing up / Shacking up’s all you wanna do”? Way to call someone out! Written and sung by Buckingham, it’s my favorite of the Rumours era singles. Listen to the guitar solo at the end. It’s pure rock ‘n’ roll and Buckingham is just shredding it up. The song hit #10 on the Hot 100 in the spring of 1977. This one was a smash on its own, rising to a peak of #3 back in 1977, but don’t think that Bill Clinton‘s election campaign back in 1992 didn’t keep this one relevant and continually on the radio. The song, which was written about Christine McVie‘s divorce from husband John McVie, is today essentially just seen as an anthem for moving forward and remembering that the past is gone. The vocals are shared by McVie and Buckingham, with that rolling drum shuffle at the beginning and some good guitar work by Buckingham. It’s a classic for good reason. Pretty much all three of the big singles from Bella Donna receive regular rotation at Classic Rock radio, and this has to be the most-played one. Everything about it is perfect, from the guitar line to Nicks‘s intense vocals, especially the backing ones. “Seventeen” is a rocking tune about a girl who becomes enamored with a guy, but as she gets older, she can still recall her youth and her freedom, which she likens to a “nightbird singing ‘come away'”. Though it wasn’t her biggest solo single, peaking at #11 on the Hot 100 in 1982, it’s probably her best known one today. Inspired by Prince’s “Little Red Corvette”, the Purple One actually played the synthesizers that you hear on this track. Trending into more of a Pop sound than the Rock one found on Bella Donna, The Wild Heart was still a big seller, with this single becoming one of the highest charting of her career, peaking at #5. It’s a cute song that still gets some airplay today. You can’t help but love this one. Initially included on the soundtrack to National Lampoon’s Vacation, this one wasn’t a big hit as most people think it was. It only climbed as high as #82 on the Hot 100 in the fall of 1983. It’s a tad bit on the repetitive side, but hey, if you’re taking a trip, I’d rather hear this than the standard “On The Road Again”. Must be that hand-clapping that really gets you going. There’s even a dog barking at the end of it. I mean, can you fit anything else into this song and still compact it down to two minutes and ten seconds? It’s short and it’s sweet. Man, this one does not hold up today, but it’s a perfect slice of 80’s synthesizer-based Pop music. It’s probably my favorite from Buckingham’s solo catalogue of singles. It has a troubling message about losing power and control, but you can still dance to it. The lyrics are sort of up for interpretation otherwise, but the mystery of it all, in addition to the funky, futuristic arrangement, make the track enjoyable. “Insane” hit #23 on the Hot 100 in 1984. With an awesome bass line and vocals by Lindsey Buckingham, the first single from Tango In The Night was a different sound for the band, who had become accustomed to releasing ballads and mid-tempos for several years. The video was a big part of why this song did so well, using some interesting camera angles and editing to make it seem like you’re flying through rooms, windows and space. It’s a very sensual song, but not all of them can be about breakups, right? This awesome track peaked at #7 on the Hot 100 in 1987. This was the fourth and final top-40 single from the Mac’s 1987 album, Tango In The Night, led by a vocal from ex-member Christine McVie. It’s pretty dated sounding at this point, but the guitar work and the quick pace of the keyboards make this track unique. This hit #14 on the Hot 100 in early 1988, becoming one of McVie’s last top-40 hits as a member of the band. This was the first song I ever heard from the band as one of the stations played this quite a bit even though it wasn’t a hit on the CHR format. It was a mid-charter on the Hot 100 in 1998, though the album version originated on the band’s 1975 self-titled album. There’s something so vulnerable but beautiful about Stevie Nicks‘s vocals on this version. It’s been covered a few times over the years, but this is the version I always go back to. Simple arrangement, no bells and whistles. Vocals with conviction. Close your eyes and just hear the music. From her solo release Trouble In Shangri-La, I used to see this video quite a bit on VH1 when it was on the charts. It’s the lighter side of Stevie, with some soft piano and a little bit of drum for some flavoring, and, of course, solid vocals from her as usual. This release was a major comeback for Nicks to the Album Chart, becoming her first album to hit the top five since The Wild Heart back in 1983. “Day” was a top 20 entry on the Adult Contemporary chart. With so much tension between Buckingham and Nicks on and off during the years, it’s sort of ironic that the big hit from their album Say You Will was a song called “Peacekeeper”. There’s a series of lines in this song that I love, about how “friends” tell us the proper way we should “paint our face” to others, “But there’s only one brush we need / It’s the one that never leaves a trace.” Really nice analogy there. I didn’t really appreciate this one at the time because I wasn’t aware that it was released, but I’m glad I get to pay my respect to it now. I first heard this song back in the summer of 2008, featured on Buckingham’s solo album, Gift Of Screws, and it made the New & Active portion of my chart for a few weeks. This sounds so much like it could have been on Buckingham’s very first solo release in 1981, Law And Order. I suppose the list comes around full circle at this point as this one is about another relationship gone sour. The protagonist takes a trip to “get free” and laments about how demanding his significant other is, questioning if she actually misses him. Being so late in his career, Buckingham’s vocals are just as strong, and even though the effort didn’t see mainstream success, it was still a hit with the critics. For members no longer with the band, check out “Precious Love” by the late Bob Welch and “Love Will Show Us How” by Christine McVie. In my opinion, they’re the best solo single by each act. Welch’s is a Disco-leaning release from 1979 and McVie’s is a straight-up Pop track with a fun video from 1984. That’s just fourteen tracks and there are countless others out there. Have a favorite that I missed? Let me know in the comments or on Twitter: @AdamFSoybel.